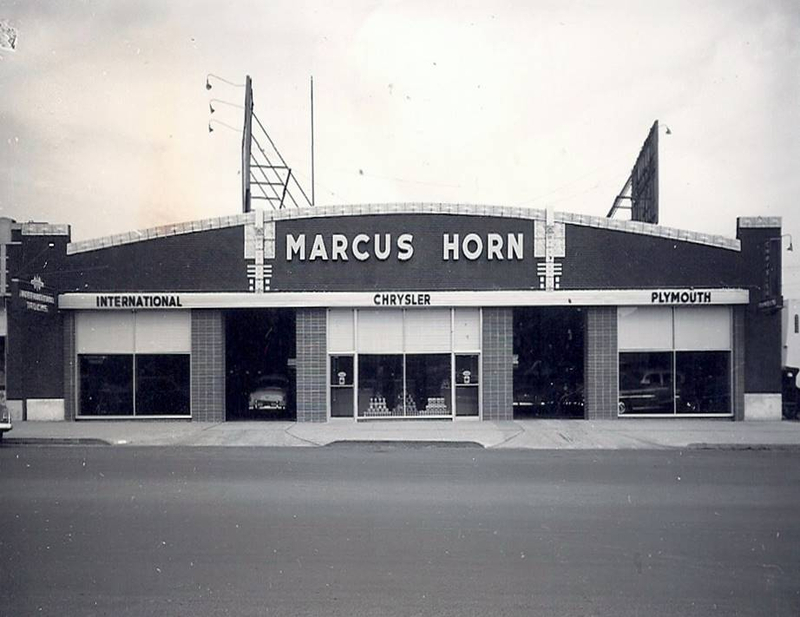 Marcus Horn began his career in the automobile business by managing a car dealership before World War II. After war broke out, Marcus Horn enlisted and went through Officer Training School. He subsequently commanded the 13th Armored Division. Diane Kennedy, Horn’s daughter, remembers living in several locations across the country. The original Marcus Horn location on Dewey was a prime spot for Sapulpa parades, like this one in the late 1940s. In December 1945, Horn and his family came back to Sapulpa. He then started Marcus Horn Chrysler-Plymouth on East Dewey, just west of the courthouse. In the early 1950s, Horn moved the dealership to 113 South Main Street. Updike Advertising, the building that would eventual house the Marcus Horn dealership. This location had been the home of Updike Advertising. Several members of the Updike family were killed in a tragic car accident north of Sapulpa. A surviving member of the Updike family sold the building to Horn. Horn later acquired the International truck franchise. Diane Kennedy remembers her father selling trucks to Sapulpa Brick and Tile. They also sold some bare truck chassis that were the undercarriages for school buses. Tragedy struck the business in 1956. According to the Fire Department, a lit cigarette was apparently tossed into a trash can and started a fire that burned the building to the ground. Diane Kennedy remembers finding out about the fire while she was attending the University of Oklahoma. As a college student, she remembered worrying how would they eat since the family business was utterly destroyed. Kennedy came home to help sort out the inventory of parts and equipment for insurance. She said one of the saddest things about the fire was a clock that was destroyed in the fire. Horn’s men in the Armored Division had given him a clock made from tank parts. This clock held a very dear spot in her dad’s heart. All they found was a lump of melted metal. Horn rebuilt in the same location and subsequently acquired the Dodge franchise. Shortly after Diane Horn married Thomas John (T. J. ) Kennedy, he was able to acquire the Buick dealership from Bill Herring Buick, next door to the Chrysler-Plymouth-Dodge dealership. Diane Kennedy said that General Motors would not allow the Buick franchise to be in the same building as the Chrysler products.The Buick dealership stayed in the Herring building. T.J Kennedy later acquired the GMC truck franchise. Chrysler products were later dropped from the dealership. T. J. later took over the family business and changed the name to T.J. Kennedy Buick-GMC. Marcus Horn then became the Creek County Election Board Secretary. The Buick and GMC franchise was sold in 1992. In the spring of 1993, they became strictly a used car dealership. The official name of the business was then T. J. Kennedy, Inc. Eventually T.J.’s son, Phil Kennedy, took over running the used car dealership and currently operates the 70-plus-year-old family business with his mother, Diane Kennedy. From what I gather, his mother is the “boss and star of the TV show.” Phil remarked that the number of independent car dealers is dwindling across the country. He also lamented the fact there were no new car dealerships left in Sapulpa. I wish to thank Diane Kennedy and Phil Kennedy for graciously granting me an interview. I could not have written this story without their help.